It is Computer Science Education Week. This is a worldwide movement to get schools everywhere doing an hour of code. It started in 2009 and nine years later it is one of the largest learning events in the world. 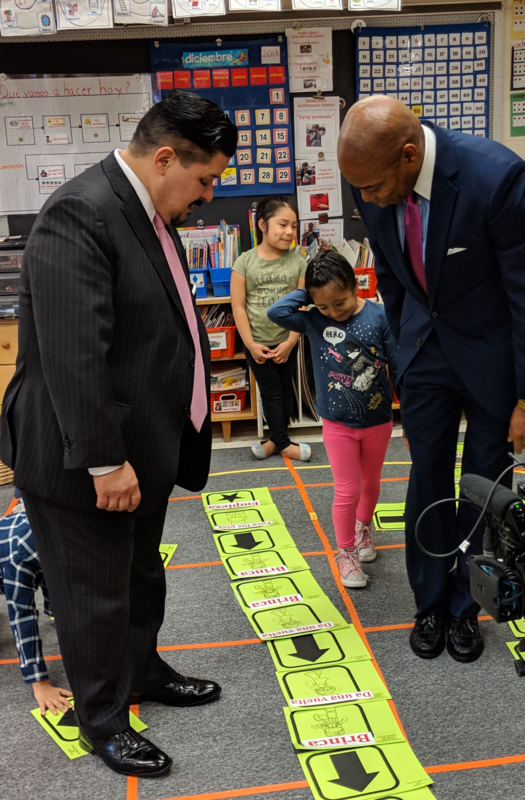 I celebrated CS Ed Week yesterday morning by visiting PS24 with NYC Schools Chancellor Richard Carranza and Brooklyn Borough President Eric Adams. PS 24 is a dual language (English and Spanish) PreK-5 elementary school in Sunset Park Brooklyn. The school is led by Jacqueline Nikovic and the student population is 88% Hispanic and 45% are English Language Learners. We started in a kindergarten that was a dual language integrated co-teaching classroom. That means these students are being supported in their effort to acquire a second language (English). 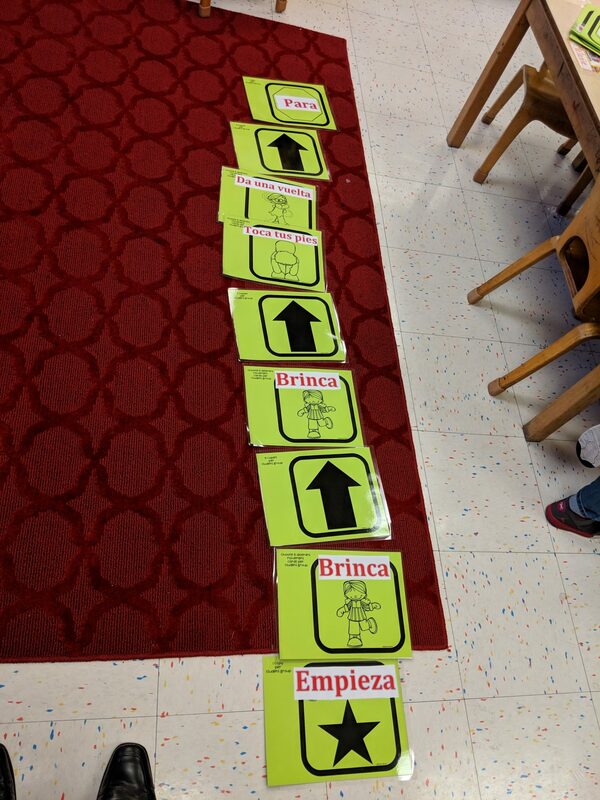 The students were using cards with Spanish words on them like Empieza (start), Brinca (jump), and others to create an instruction set. They then followed the instructions. Here’s a photo of one of these instruction sets (those are my shoes on the lower left). This is a student showing the Chancellor and Borough President her instruction set. By the time they get to fifth grade at this school, the students are doing Scratch programming in the computer lab. In this photo below, the Chancellor was pair programming with a young man and a young woman (who unfortunately is blocked in this photo). Let’s just say the kids were doing the teaching and the Chancellor was doing the learning. PS 24 adopted NYC’s CS4All program this year so it is the first year that teachers in the school are getting professional development in computer science education. Everybody I met at the school, the Principal, the teachers, and the students, seem incredibly excited about getting computer science in their school. I was particularly impressed how PS 24 has made CS accessible to english language learners. The whole idea of CS4All is that we need to make these skills accessible to all learners, regardless of gender, race, age, neighborhood, language, etc. Though the teachers and students made it look easy yesterday, none of this is easy. The NYC Department of Education, and the private sector supporters of CS4All, are doing something very hard, introducing an entirely new subject into a curriculum that has largely been stale for the last fifty years. Sometimes I struggle with how hard this work is. But when I go out to the schools, which I have done twice in the last month, I get totally energized. Seeing the excitement on the student’s faces makes it all worth it.